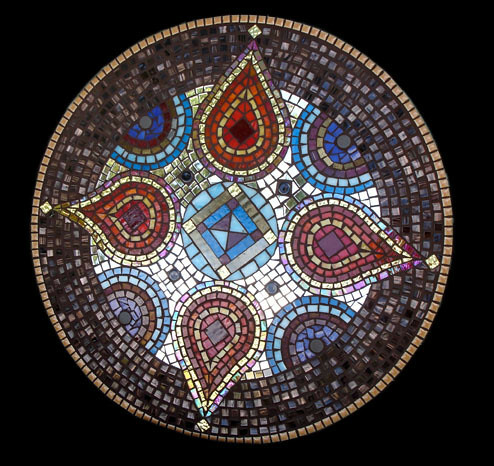 If you’re interested in learning how to create a mosaic mirror from scratch using predominantly glass tesserae (vitreous glass, stained glass, glass gems etc) then I will be running a workshop in November. Dates are Saturday 20 November (10:30 – 4:30pm) and Sunday 21 November (10:30 – 4pm). You will learn how to cut out your final shape using a jigsaw and learn how to cut different kinds of glass and assemble the mosaic. The class is catered to creating a piece with an approximate dimension of 40cm square. Get creative, though, and think about making a mirror where the mirror itself is off centre, use strips of mirror instead of a block piece etc… Get funky and deviate from the normal square/rectangular mirror! There is no grouting in this class so if you have not grouted before I do recommend signing up to my Grout Clinic. Cost is $185 + a $45 materials fee. Check my website for more details and if you want to sign up then email me! Examples of Mosaic Mirrors follow. By Sue Edkins of Mostly Mosaics in the UK. by Carl and Sue Bryant of Showcase Mosaics. 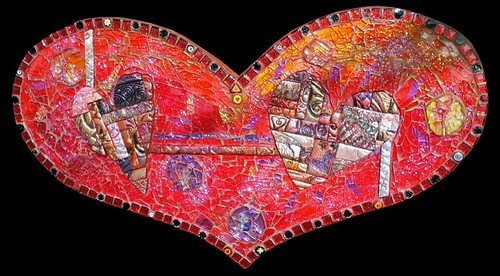 Queen of Hearts Mosaic Mirror by Erin Haworth. Star Mirror 5 by Erin Haworth. Fire in Bloom by Crystal Thomas. Anyway, let’s get straight back into meeting fellow mosaic artists, shall we? Please meet Francesca De Lorme aka Studio Fresca on Flickr. Reading through her bio is like reading a fine novel! Not only can she make beautiful art, she can write – I daresay I think she can do everything 😉 Francesca only recently caught my eye and it was initially because of her really well thought out and articulate comments she left for others. Then when I clicked into her photostream… *sigh*! 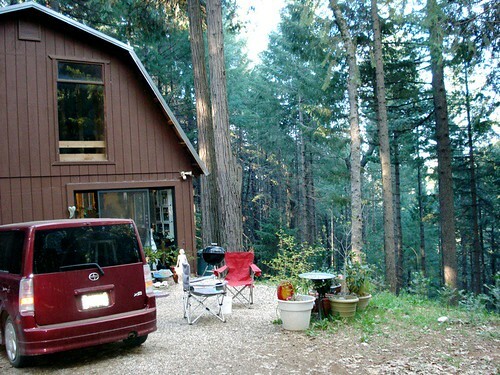 Depending on the year, the season, her school schedule, her husband’s job contracts, the weather, and their mood, they can be found living in their homestead in Vermont (which they designed and built themselves out of about 60% recycled materials), working on the island of Kauai (where Francesca can mosaic outdoors all year long!) or travelling around somewhere in the world where they can visit galleries, coffee shops and junk yards. However, she can most frequently be found under the influence of expensive tea and cheap chocolate! You can check out more of her work and musings on her website. One of Francesca’s current projects is a mural in the cafe of a high school in Vermont. Each student has a 1 foot square “canvas” (with a black tiled border) in which to create their own composition. I look forward to seeing this project evolve! The next artist-in-waiting is Crystal Thomas. I met Crystal on Flickr and she promptly showed up in other mosaic forums. I am currently in love with her mosaics 🙂 She does exactly what I want to do: subdued, elegant and sophisticated work!! 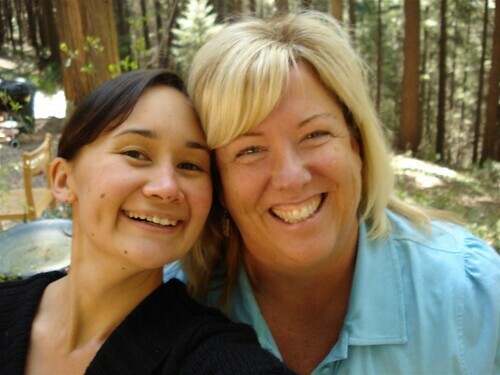 Crystal’s story into her life of mosaics began much like mine did. She never considered herself to be artistic “I don’t draw, paint, or sculpt”, yet there was still a part of her that felt the need to create. She, like me, was drawn to a book on mosaics while at the bookstore one day. For her it happened back in 1998 and she has been creating ever since. What started as a hobby craft soon led to more complex designs and challenges. She slowly began to realize that this was becoming a form of art for her, and about the same time, she noticed that mosaics seemed to be growing noticeably more popular as an art form in and of itself. In 2002, Crystal went on a mosaic tour led by Gina Hubler which included a pilgrimage of sorts to the Mosaic Art School in Ravenna where Crystal had the privilege of reproducing an ancient mosaic in marble and smalti. “Now I’d seen many of the world’s great mosaics and worked with modern masters, and I was undeniably hooked!”. The tour included a 3 day workshop at the the Art School, instructed by Luciana Notturni. “Our experience was a bit unusual, I think, because there were only two of us on this particular tour (me and my mom! ), and therefore only two of us in the workshop. Needless to say, we got a lot of personal attention, and it was a fabulous experience. I believe our lessons were not in the main school, but in a smaller workshop, where we were actually working alongside some of the professional mosaicists who were working on “real” restorations. I would absolutely recommend a workshop with Luciana!!!”. The tour has changed somewhat since Crystal went, but she did go on to say how wonderful it was – “…a wonderfully balanced trip full of visits to some of the world’s most amazing mosaics and master studios, hands-on work, sightseeing, and of course good food and wine. Seeing those ancient mosaics and meeting Italian masters was a humbling experience…”. Sounds like sooo much fun! Crystal did not, apparently, come home from her experience there and immediately start creating her own masterpieces our of smalti with her newly acquired hammer and hardie! Rather, she has barely touched smalti since the trip. Her time in Ravenna unexpectedly inspired her to more of the modern mosaic frames and mirrors that were on display in the store at the Art School. 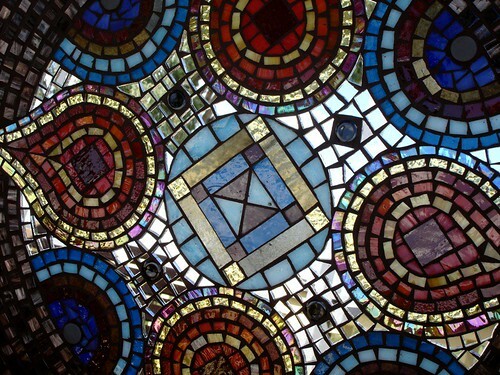 The designs were mostly geometric patterns and made of a variety of glass and millefiori (think Laurel Skye). She arrived home and went on to make mirrors and frames for the next few years. For pics of this tour head to Crystal’s Flickr set. Last year Crystal had 26 frames up for sale on her Etsy site. One day she was contacted by a couple in Texas, totally out of the blue, who had just moved there to follow their dream of opening a retail art store. They bought ten of her pieces, and shortly thereafter bought the rest! A couple months later, they called her with an idea and this is how Crystal’s Skulls Series was born. “You’re going to think this is crazy, but people here in Texas really like their cow skulls. We were wondering if you would like to mosaic a couple.” A couple turned into five, and she may yet do more. “I’ve been amazed at how such an unusual “substrate” could provide so much opportunity for both technical learning and creative expression!”. And finally meet Crystal, pictured here with her piece she made on her trip to Italy! 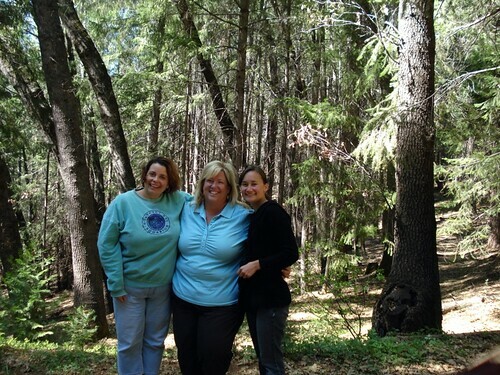 Janine’s path to Mosaic Art was not without a detour or two along the way. Two major curves in the road were a career in foreign language education (specifically teaching Spanish) and raising two children in the Twin Cities area of Minnesota. Although Janine had had no formal art training, she always had a deep desire to create. During the 80’s when her kids were young, she became involved with folk art painting on wood and quickly became an expert at wielding a jig saw to cut forms suitable for the desired paintings. “Could there be a connection here with cutting shapes?”, she asks. The motivation to pursue some sort of art was cultivated further by her children. Both son and daughter took several art classes in high school. “Their work”, she says “as any mother would say, was phenomenal! I figure…, they have my genes…I must have some artistic ability too!” So in 2004, Janine retired from teaching, children were graduated and on their own. She was ready to embrace art and unleash her creativity! Janine began her artistic endeavors, full speed ahead, with a variety of drawing classes, design classes, and watercolour classes at several of the local art centers. All have been an integral part in her artistic journey. I find this story so inspiring… let’s have a peek at her incredibly detail-oriented art now, shall we?! When I asked Susan if there was anything she wanted from Australia, she said the only thing she wanted was a mosaic I’d made. Well, not having all that much left I did have Flutterby which now resides with her 🙂 and I’m so glad it does. I in turn got Big Love… Just what I needed! I own 5 Crocenzi originals now 😉 One would think I’m a fan of her work or something! Susan was also gracious enough to let me sit in on her 1st class. I think it’s the beginning of a new career for her… Having been a teacher for the last 15 or so years, she’s a natural at it and her classes are fun. Guaranteed you’ll come away from one, or two (?) classes with a piece you’ll love. I know it has made me look at the potential of my mosaics in a different light, which came at a very necessary time as I was feeling rather blah about everything for a while. The combination of the mural intensive, Susan’s tempered glass class and me having just gone on a *major* de-cluttering of my house has got me all enthused again. Nothing like getting rid of crap. It literally clutters your soul and it is so therapeutic to chuck. Donna’s tempered glass and polymer clay piece, Wild Hearts. It’s about all I could afford, lol! Overseas travel opened her eyes to mosaics using so many other kinds of materials. She saw the magnificent mosaics on St Marks Basilica in Venice and was also lucky enough to stumble upon the Orsoni Factory. She was thoroughly enchanted by Gaudi’s mosaics in Barcelona and the pebble mosaics in the Alhambra in Granada. In November 2004, Wendy attended the International Association of Contemporary Mosaics biennial conference in Melbourne …and was inspired by so many wonderful mosaic artists from all over the world. 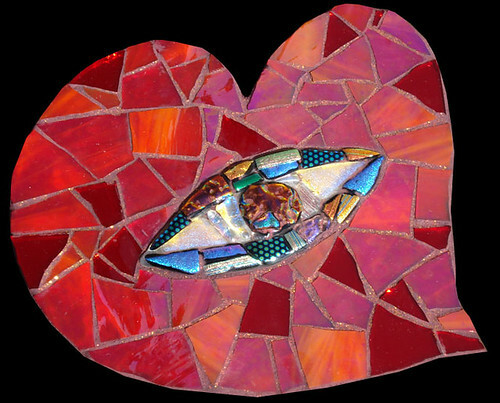 Since then she has attended several other workshops with Australian glass and mosaic artists. Wendy works with many different materials – and especially likes to use recycled or found objects. Her preference lies in making functional objects like tables and mirrors, but she is also exploring decorative and artistic mosaics, and 3D sculptural forms. Wendy has taught several mosaic classes through the local Adult Education Centre, and has also taught several workshops with school children and teachers at three local schools. They created large scale murals, which brighten up the school grounds considerably. She loves the fact that anyone can make mosaics – no matter their age or ability. You can find Wendy’s online space here and more of her mosaics on her Flickr site. Her work has, more recently, been selected for the new mosaic magazine, Mosaic Art Now and is currently on exhibition at the Nexus Gallery. Here are some pics of the artiste in question ( couldn’t choose just one cos I LOVE all of them!!!). Look at that school mural and all of her travels!!! Wendy in Barcelona’s Parc Guell, a place that, like Wendy says, is “about as close as a mosaic artist can get to heaven.” No kidding!! !